Can a few promoted posts do the trick, or do you need more control over ad placement and objectives? Or can organic alone fuel what you need? And if so, how much is enough? Read on for a breakdown of your options, and our recommendations for crafting the social media strategy that is the best combination for your situation. Facebook advertising can take many forms, from videos or photos to mobile-focused full-screen interactive experiences. Here is a list of options you may choose when using Facebook’s built-in Ad Manager to create, schedule, and bid for advertising appearances. Video ads: Facebook video ads can range from short animated GIFs that simply add eye-catching movement to longer videos designed to tell stories about your brand or showcase your products, with placement available in-stream as well as in a separate clickable ad. Image ads: Image or photo ads can be quick to create as ways of showcasing visible products or developing a series of ads that work together. Collection ads: Several versions of Collection Ads are available, all focused around showing Facebook users your products with a quick connection directly to a mobile landing page or purchase site. Instant Storefront, Instant Lookbook, Instant Customer Acquisition and Instant Storytelling all group together a primary video or image with additional images in a grid to make them easy for potential customers to browse. Carousel ads: Carousel ads showcase up to 10 images or videos in a single ad, each with its own link. This format could be used to show off multiple products or to highlight the features of a single product in an interactive format that encourages viewers to swipe for more. Slideshow ads: Slideshow ads allow you to create a video, complete with motion, sound, and text, from photos, including existing images. Instant Experience (formerly Canvas): Instant Experience content opens after someone interacts with your ad on a mobile device, providing a fullscreen experience that can allow visitors to watch videos, swipe through photos, complete forms and more. Lead Generation ads: Lead Generation ads can begin as an image, video or carousel ad, but then are followed by a lead capture form when the user engages with the ad, with the form already pre-populated with the user’s Facebook contact information. They make it simpler for viewers to convert to leads on mobile by doing most of the work filling in the form for them. Offers: Image, video or carousel ads can be used to provide Facebook users with offers for discounts, such as a barcode or QR code to use in-store with their mobile phone or as a discount code to be used on your website. Event Responses: Advertise your event with an image or video ad to promote awareness and drive responses. The ad can link directly to your website or app where Facebook users can buy tickets or sign up. Page Likes: These ads are designed to reach new audiences and encourage them to like your Facebook page. You can choose an audience based on gender, age, location, interests, demographics and behaviors. OK, so you’ve chosen the style of ad you want to create and use, but where will it appear? Choices include in the Facebook feed, in the right column, as instant articles, in the Facebook Marketplace, as a Facebook story, as a sponsored message, or in formats that aren’t actually in the Facebook interface itself, such as Facebook audience networks in mobile apps other than Facebook. Facebook ads give you the most control over how your content appears, who will see it, and in choosing an audience most likely to take the desired action, whether that is to visit your website, contact you through Messenger, download a discount offer or buy tickets to an event. Another way to use paid promotion to extend your Facebook reach and visibility is through boosted posts. Facebook calls this the “simplest way to advertise on Facebook,” because rather than requiring the creation of a separate advertisement, boosted posts simply push your existing content into your audience’s news feed as an ad. For example, if you posted a link to your newest aesthetician’s bio on your website, and it received a lot of organic interaction, you may want to stretch it even further by boosting that post to a specific target audience for another two weeks. As with other ads, you set a maximum budget for the boosted post’s campaign, and you can choose between two objectives: website visits or engagement (e.g., reactions, comments and shares). 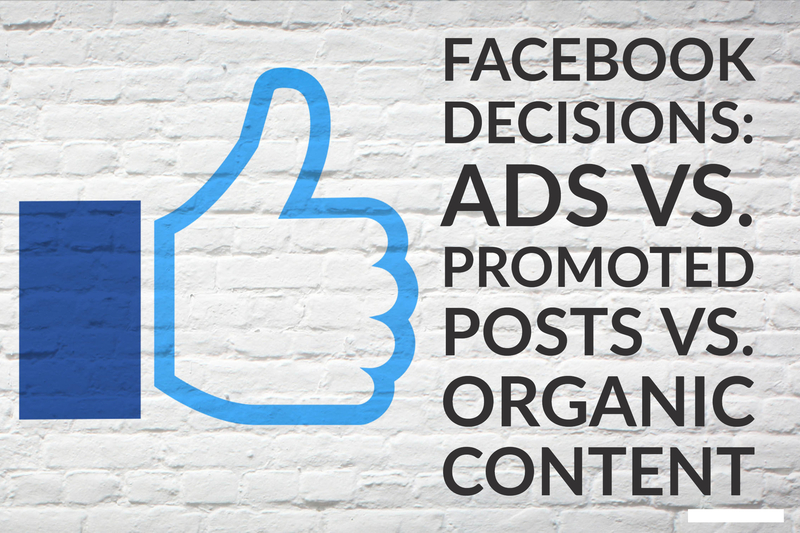 Boosted posts do not have all of the same audience customization and placement options available when creating official Facebook ads with the Ads Manager, however, which could limit the effectiveness and ROI. Boosted posts may be best used when you want to maximize the visibility of a specific single post, such as an upcoming event, where increased interaction with the post also serves to provide social proof. Organic content should be at the heart of your social media presence. While paid advertising and boosted posts are useful in order to quickly expand reach beyond your current followers, paid advertising alone won’t build the kind of social media presence that creates relationships and showcases your business personality and culture. That requires a robust page that features useful, engaging organic content. The statistics around organic content may, at first glance, look bleak. On average, each organic post is seen by only 2 percent of page followers. But that “average” is definitely short of the potential of a well-crafted social media content strategy. In a review of Facebook engagement statistics from the first part of 2019, Newswhip found that the channel’s engagement is on the rebound after algorithm changes in the aftermath of the Cambridge Analytica scandal, with some of the greatest interaction coming from web content (that is, links shared on Facebook to non-Facebook content such as news articles, videos and blog posts). Further, nearly half of the top 10,000 Facebook posts by pages (as opposed to individuals) were photos, but when average engagement is calculated by post type, native video came out on top, also garnering the greatest number of shares. The most comments per post were generated by live video. What this means for small businesses looking to leverage their organic social media content is a need to incorporate a variety of posts to meet all of the objectives: overall engagement, shares and comments. Link to informative or entertaining videos or articles that fit your brand. Create videos showcasing your business, your customers and the lifestyle your ideal customer is seeking. And use live video at times to encourage conversations. Encourage your followers to interact with your content frequently, as that will increase how frequently the algorithm shares your content within their networks. Ask questions, encourage sharing, and invite customers to “check in” when they visit your business, all of which put the power of implied referrals to work when your followers’ friends see their interaction with your business. One of the key rules to follow is to create content that is more about your followers than it is about selling them your product. As consumers, we have become very good at filtering out advertising and the hard sell, and we will ignore content that seems to have only sales in mind. Provide value instead, and you will earn trust, engagement, and return visitors. Constantly, regularly to build a consistent level of trust, engagement and interaction with your audience and create a profile that provides a positive impression to new visitors and prospects. For many businesses, the best strategy is going to include all three of these options, starting with a strong organic content strategy, then using promoted posts and more targeted Facebook ads to achieve specific objectives such as increasing attendance at an event or growing the overall audience for the Facebook page. Download this case study for more on how simply boosting your small business’s posting schedule can greatly impact overall social media reach, or click on the chat to talk with me about our options for helping small businesses, including medical spas, day spas and more, maximize their social media presence.